Length: 7.6 miles Click on the icons in the text below for photos. From Spruce Run Headquarters, proceed to the Spruce Run entrance on Van Syckel's Road. Turn left and follow Van Syckel's Road for about 400 feet. Turn right onto a gated gravel road, which takes you into Clinton Wildlife Management Area. After a short distance, turn left off of the gravel road and walk along the edge of the fields, parelleling Van Syckel's Road. ALERT: The paths along the fields in Clinton Wildlife Management Area are cut in late summer / early fall. We are not permitted to do any cutting between May 15 and July 15. Between May and July, these paths become quite overgrown. Weed growth may be chest-high and stickers may be mixed in. It may be prudent to either skip the CWMA section during the summer, or to simply walk Van Syckel's Road. Turn left and proceed back down through the fields to another gate at Van Syckel's road. Turn right on Van Syckel's Road and follow it .6 miles to turn left off of the road at a gate just before the "Dog Training Area". 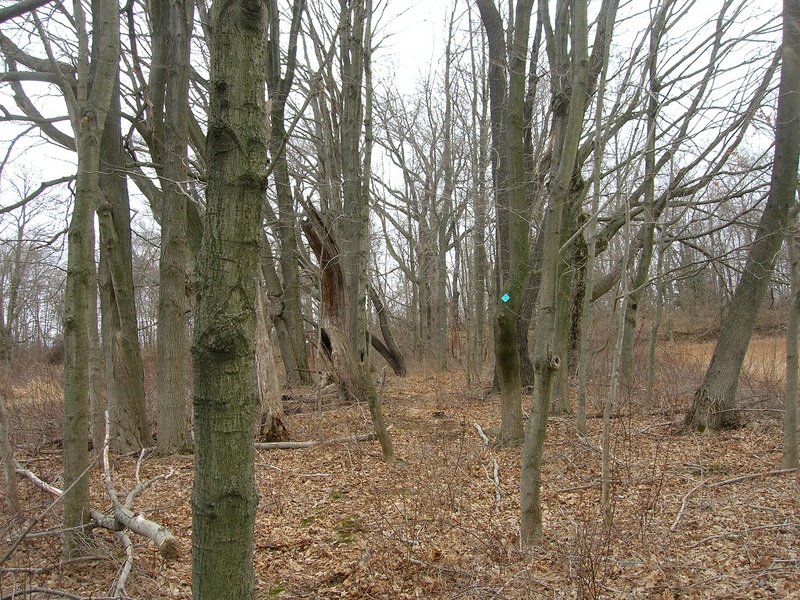 Follow woods roads past old farm fields for .5 miles, then enter a narrow trail through a Maple forest. Proceed down hill to cross a stream, then turn left at the fields. 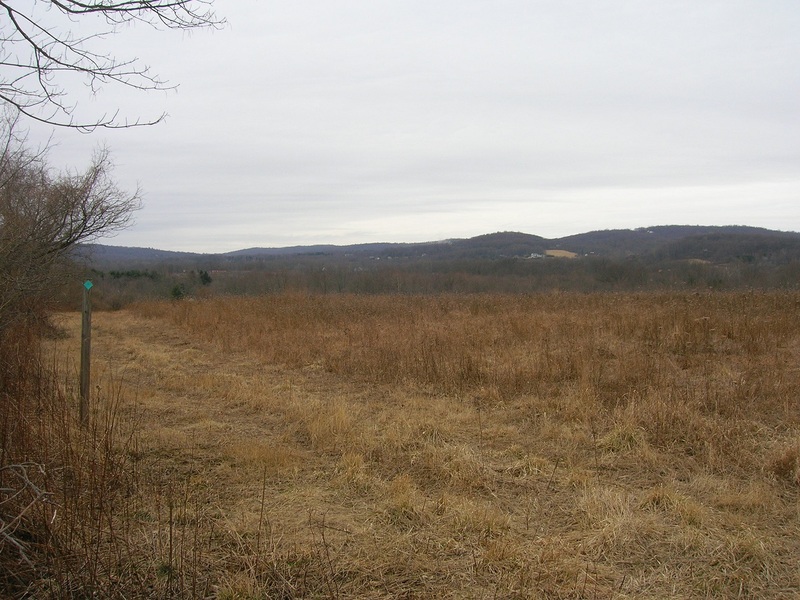 In a short distance turn left again, and follow the trail through a narrow strip of woods between the fields, reaching private Sleepy Hollow Farms Road 1.7 miles from Spruce Run. Cross directly over the road - this is a private road on private property - do not hang out here or walk down this road. After crossing the private road, turn right and follow a woods road for 450 feet to a left turn on a narrow trail. At the left turn, you will see a barn straight ahead on the woods road - do not trespass on this private property that is straight down the woods road. Follow the trail downhill, cross the swampy end of a lake, then up to another woods road. Turn left, and follow this woods road along the lake. The woods road emerges into more fields. Many paths diverge in this area. A blazed post has been added to guide the hiker. If in doubt, take the straightest route and you will find more blazes. Watching carefully for turn blazes at intersections, follow woods roads and trails cut along the edges of fields, reaching Van Syckel's Road again near the intersection with Charlestown Road at 2.8 miles from Spruce Run. Turn left on Van Syckel's Road and proceed 375 feet to Charlestown Road. Turn Right on Charlestown Road and go .6 miles to a left turn on Norton Church Road. Go .7 miles on Norton Church Road to a right turn on Mountain View Road. 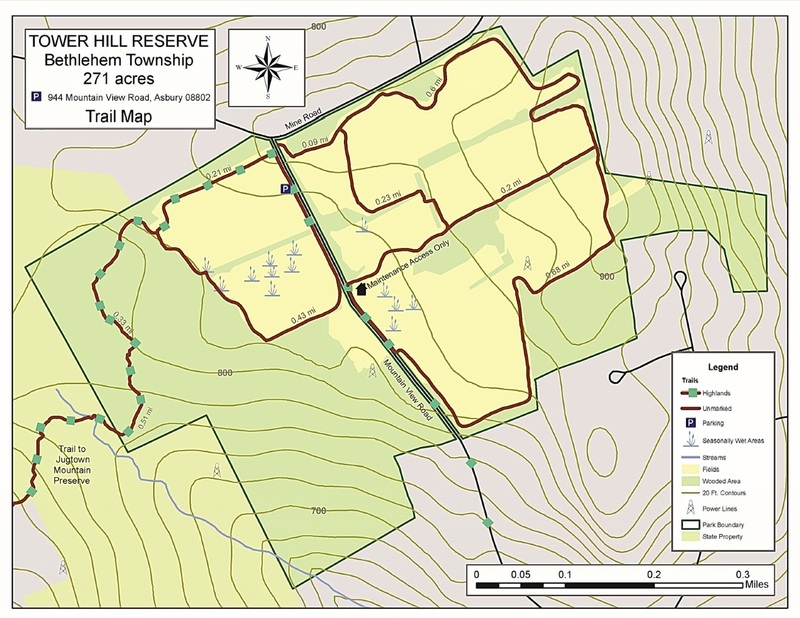 Go up Mountain View Road for .9 miles, reaching the small parking area for Tower Hill Reserve on your left, 5 miles from Spruce Run. 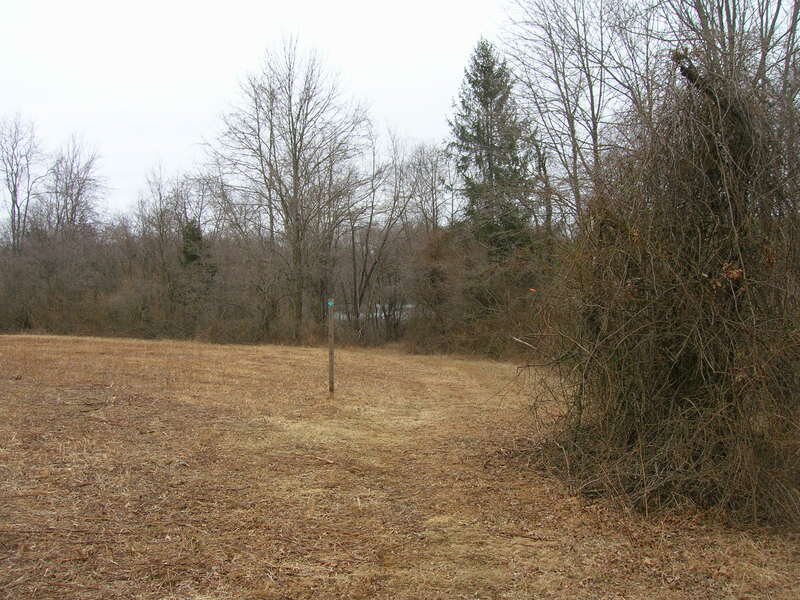 Turn left off of Mountain View Road into the fields on a mowed path 200 feet past the Tower Hill parking lot, and follow the mowed path around the edge of the fields to the second right turn into the woods, which is indicated by a blazed post. Follow this trail as it threads its way through the driest areas between wetlands, coming to a gas pipeline. Note: This pipeline is quite wide. Effort has been made to mark the trail entrances at the pipeline. Blaze posts cannot be placed out from the trail entrance on the pipeline itself, as they will get destroyed when the line is mowed each fall. In either direction, the opposite trail head at the pipeline is across and slightly to the left. 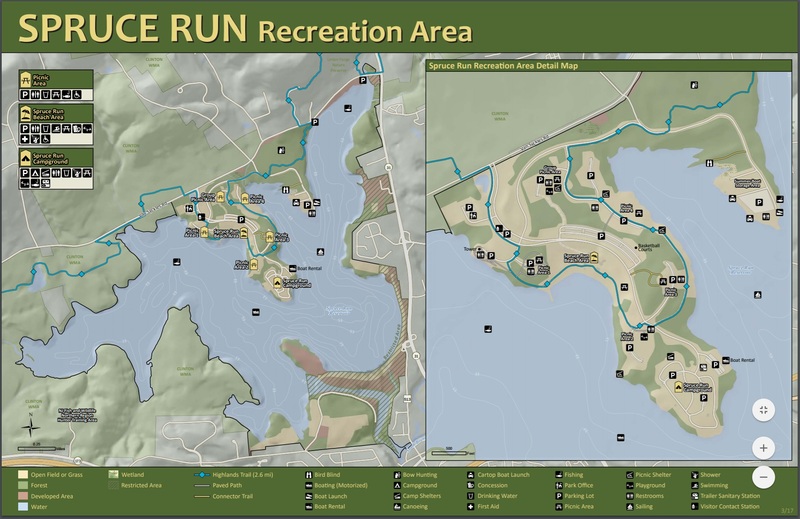 Cross the gas pipeline and re-enter the woods, following the trail over a stream, through a wet area, and up to Mine Road at 1.4 miles from the Tower Hill parking lot, 6.4 miles from Spruce Run. Turn left on Mine Road, and proceed 300 feet to a right turn over a rock wall into the woods. 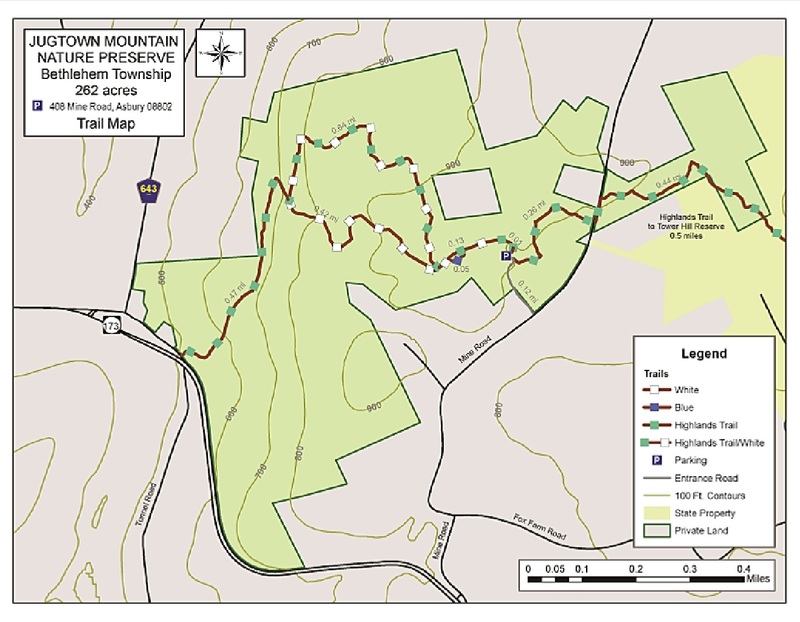 Follow this trail for almost 700 feet to a junction with a trail marked with blue Hunterdon County Parks Commission blazes. Turn left on the co-aligned HT/Blue Trails and follow them past old mine tailings and flooded mine shafts out to the Jugtown Mountain Preserve parking lot. Cross the parking lot, passing the kiosk, and continue on the co-aligned HT/White Trails that begin behind the kiosk. Follow the HT/White Trails for 850 feet to a fork. Along the way, the Blue Trail enters from the right, then exits left to circle through some old mining foundations before reentering on the left. Turn right at the fork in the White Trail, and follow the trail down Jugtown Mountain, reaching a junction where the White Trail goes straight and the HT turns right. Turn sharply right on the HT, now on a woods road, then sharply left onto another woods road. Follow this woods road down to the corner of Brunswick Pike & Route 173 1.2 miles from the Jugtown Mountain parking lot, and 7.6 miles from Spruce Run.